Turunç Bay indents to the west between points; Zeytin Burnu and Sarp Burnu. The bay is open to E. Turunç Bükü and/or Turunç Koyu affords sheltering from breeze. Strong westerlies send swell in. The valleys are thickly wooded with pine trees. There are reefs running out for about 180 m in the depth of 1m on W tip of the bay towards Zeytin Burnu. There are isolated rocks around Sarp Burun and there are rocky patches on the northern part of the bay, in the vicinity of point; Dümbek Burnu. Care is required. The creek on the SE is the best shelter to be tucked up. The swimming area is cordoned off with buoys. Turunç Municipality has placed 20 floating moorings. You can pick up and swing. Submarine communication cables are on the northern corner. Three yellow buoys indicate the cable line, one buoy flashes. A stream goes into sea on the southern side. There is a concrete quay with berthing capacity up to 70 boats. This quay gets crowded during the day. Yachts arrive in late afternoon and leave before noon the next day. 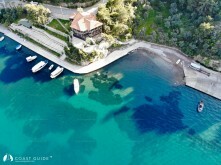 The municipatiy administrates the quay (Phone :252 476 79 40/41/42) and charges berthing fee. The bottom is weed. Care is needed while anchoring, ease your chain as much as possible and make sure your anchor dug in well. Water and electricty connections are available. Fuel can be obtained from tanker-truck. Turunç has become one the prettiest spots in Marmaris with its real nice settings. A number of pensions, hotels of diffrent classes have been opened. All provisions can be found from the markets. Bank ATM's, pharmacies, State clinic and Gendarme station are in the vicinity. Regular transport facilities are available to Marmaris. Turunç is a favorite spot for divers.